A small loop Moskvoretskiy Rynok in the south of Moscow has venerable age. 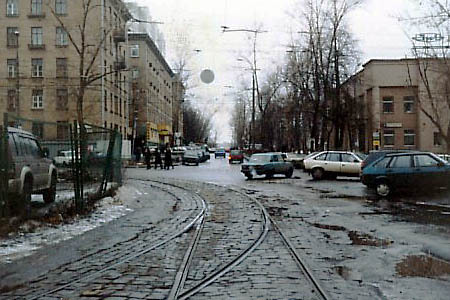 The first trams came to this loop, located in an industrial community of Stalin automobile plant (today named ZIL, or Likhachev automobile plant), on 7th November 1937. The loop was the southern terminus of a newly built line from Verkhniye Kotly village, being far beyond the city boundary those days. 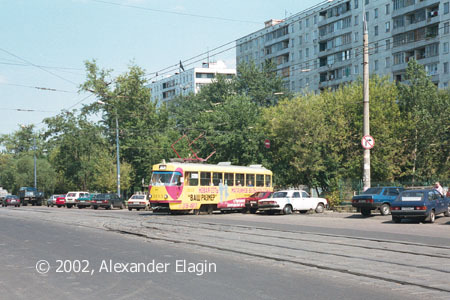 Time has passed, the district became a large residential zone of expanded Moscow in 1960s, and the tram line was also extended farther to the south along a new Simferopol boulevard. 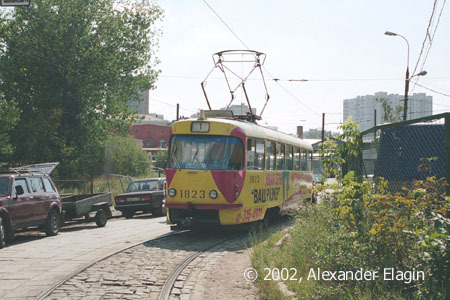 But the loop remained in place, the only change it suffered was a change of direction - while previously it used to reverse trams coming from the north, now it is used by trams of route 1 coming from the south and having its north terminus here. 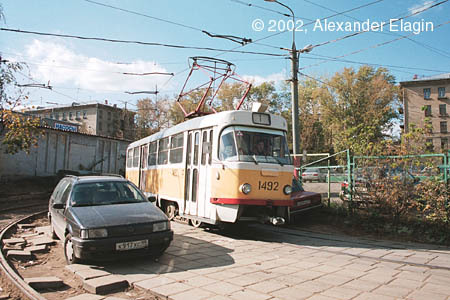 Tatra T-3 #1492 is entering the loop using its inner track. The outer track, as you can see below, is pretty unusable per se. 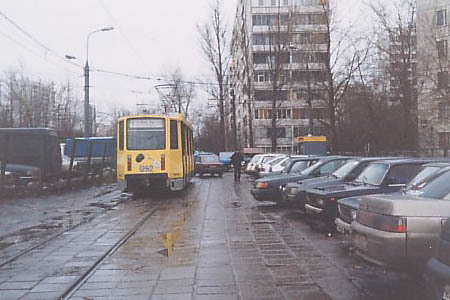 Although the loop has two tracks, only one of them is available for trams. The second one is mercilessly occupied by motorists who consider it as a free parking lot. Tatra T-3 #1823 is having a brief rest before departure, while its driver takes a chance to walk and relax. Tram exits the loop, ready for another southbound journey on route 1. A quite large section of tracks is paved with stone blocks. This type of pavement is almost completely gone from Moscow streets.